During the period when Sri Krishna Deva Rayalu was ruling the Vijaya Nagar Empire with Hampi as his capital, Mohammedan Sultans were ruling Delhi. The Sultans were powerful and were ruling many parts of Northern India. They were always attempting to invade on Hindu ruled kingdoms and grab them into their fold. For declaring war the Sultans used to find one or the other ploy. We have the pleasure of inviting all the wells in your kingdom to attend the ritual and their (the wells) presence is solicited. The tremor did not stop there. A warning letter was attached along with the invitation. The warning letter said that in case the King failed to send all the wells in the concerned kingdom, such action would be treated as an insult and will be liable to face the fury of the Delhi sultan. Rayalu, on receiving the invitation along with the letter through a personal messenger from the Sultan of Delhi could not understand what to do about this invitation. This is because, everyone knew that sending wells from one place to another is practically above impossible. Rayalu was in total confusion what to do and what to reply. Thinking for sometime to find a solution to this problem, in vain, Rayalu forwarded the puzzling wedding invitation and warning letter to the Chief Minister Thimmarusu and sent a message to come out with a viable solution. Thimmarusu found the invitation to be too strange and the problem like a complex puzzle. What an invitation? 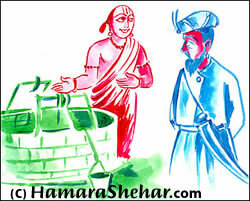 Thimmarusu thought, inviting wells of Vijaya Nagar Empire to the wedding of a well at Delhi! Even Thimmarusu could not draw out any thought close to solution that can be effective in avoiding any rift between the two kingdoms. Thimmarusu approached King Rayalu and expressed his inability to draw out any solution. Rayalu was much more tensed on hearing his Chief Minister. Then, Thimmarusu convinced Rayalu that there was no need to get so much worried, as there is a man in the service of the King, who can draw a best amicable equation. Rayalu asked about the person Thimmarusu was referring to. Immediately, Thimmarusu told the King that it was none other than poet Ramalinga. We acknowledge your invitation inviting our wells for the wedding of a well in your kingdom. We are glad and grateful that you remembered us for the memorable occasion. On receiving your invitation, we immediately read the message to all the wells in our Kingdom. Those wells are resenting your wells, as they did not attend their (wells in Vijaya Nagar Empire) wedding. Hence, we keep you informed that if your wells personally come to Vijaya Nagar and invite, our wells will definitely oblige the invitation. Therefore, you are requested to send your wells here to invite our wells personally to the wedding ritual. Once your wells come here, our wells and we together will come to Delhi for the wedding. The total gathering of the Bhuvana Vijayam cheered at once on hearing the reply intellectually composed by Ramalinga and appreciated him. This reply was sent to Delhi Sultan with a personal messenger. Sultan of Delhi was shocked with the reply received and questioned the messenger, “how can we send the wells with you?” Receiving no reply from the messenger, without any second thought Sultan dropped the proposals of humiliating Hindu rituals along with the thought of waging war unnecessarily on Hindu ruled kingdoms. Moreover, the Sultan appreciating the intelligence and wit King Rayalu had in replying his invitation and warning, sent many gifts and Farmans with the messenger to Rayalu.